Yearning to be in Italy. Studying the language, devouring everything I can about the country, planning travels and dreaming of a life there. I’m now leading small “food focused” group tours to Italy. Come join me as we cook, eat and explore together! Living to cook and enjoying everything about food. Feeding friends and family and entertaining whenever I can. I love what you are doing! Keep up the good work. Reading your blog makes me hungry and want to jump on a plane to anywhere with good food! Once you have concrete plans to come back to Italy, you should consider to go down south. Our Italian language school is called Piccola Università Italiana and is situated in the “pearl of Calabria” a little village by the sea called Tropea. Hi …welcome to Arezzo. I hope that you are enjoying the town. Hi, I’m Sara, I’m italian! I love you’re blog! I can so much identify with a lot of what you have to say here. Italy is such a special place. Do you have any particular Italian cookbooks that you enjoy? Margie-check out my posts from Dec.28 and 30 where I wrote about some of my favorite cookbooks! Ciao! I would love to exchange links on your blogs as we both share stories, pics & recipes! My husband & I live in Le Marche, we are a young couple that moved 7 months ago from the States! We own an agriturismo with cooking classes / culinary school! I enjoyed reading your blog & your pics. All the best & to italian dreams…. Great site! It’s so inspiring..
Ashley, I’m a 24yr old female and desperating wanting to visit Italy! What’s the best way to go about it on a budget? I want the full experience! I would like to see some tourist attractions but also get a real feel and taste of the culture. What do you suggest? Jennifer-I’m going to send you an e mail about traveling to Italy. Ashley-I would love to visit your place (what a beautiful location) and I have added you as a link. I like your pictures. I lived in Sicily for 3 years and it was amazing. I haven’t grown an olive tree in my backyard, since I am now living in Japan, but it’s a thought when I move back to the US. Did you ever try the blood oranges? Hollie-I’m so jealous that you lived in Sicily! I have tried blood oranges-delicious-I’d rather be eating them in Italy! Ciao bella- love that you bring Italy home with you! I am a SF girl that moved here in 84…. Maybe will see you when I come to the states in Feb! I stumbled on your blog by chance and just wanted to say it’s terrific! I’m at the American Consulate General in Naples and thoroughly enjoying the cuisine. I highly recommend the following book for your next visit: “The Food and Wine Guide to Naples and Campania” by Carla Capalbo. Robert-thank you! I have that book and just have to get back to use it! I’ll be in search of the wonderful mozzarella. Thanks Judy-I’ll either see you there or at Angeli! Ciao! I just stumbled upon your blog and I totally understand your love of Italy! I spent some time studying there last year and cannot wait to go back. I want to be a food writer and I’m starting a food blog, I’m adding you as a link – great blog! Ciao Kate-thanks for linking me. Let me know what your blog is when you have it up and running! Where did you study in Italy? Thanks for responding! I studied in Milano – che bella questa città! You can find my blog at uncaffe.wordpress.com – in it’s initial stages, but really hope to get it up and running soon! Love your blog and passions. Maybe Jason can tell us how. Fred-good to hear from you! If your family is from Calitri, then we probably are related! Have you been there? Visited for five days in August 2006 on way to Puccini festival. Magical. Loved it and can’t wait to return. Both paternal grandparents Calirani — Capossela & Cirminiello. Ironically, I was raised Catholic and St. John’s U. in Jamaica Queens, where I learned there was a Fred Capossela in attendance. Hi June-I know about the book-my mother has it and loves it-she found all sorts of info on people our family knew. My grandparents came to NY from Calitri and settled in Tarrytown. I am lucky to have genealogy on our family done back to the 1500’s. Someone else did it and sent it to me. We probably are related in some way! There are only a few Caposselas left in Calitri now. I hope to get back there soon and stay for a few weeks to explore the area. There’s a famous Italian singer-Vinicio Capossela-whose parents came from Calitri. You can find a link to him on my blog-he’s popular now. Good luck with your research. Let me know what you find out. Thanks for visiting my blog – glad you like it. You will see from my bloglist that I am following you now – can’t wait for some more yummy recipes! Like you I am smitten with Italy. It has been a few years since my travels there but the sensation of being there, the colors, the smells and the wonderful memories I have, keep me going until I plot my return. Keep on writing. I enjoy reading your entries. I just read your fantastic blog post here. It seems like we share the attitude that “Gratitude is good for you.” Grateful Nation is an online community that gives grateful people the opportunity and resources to connect, give back, and be thankful. Hopefully, one thanks will lead to another, and we’ll create an unending positive cycle of gratitude. 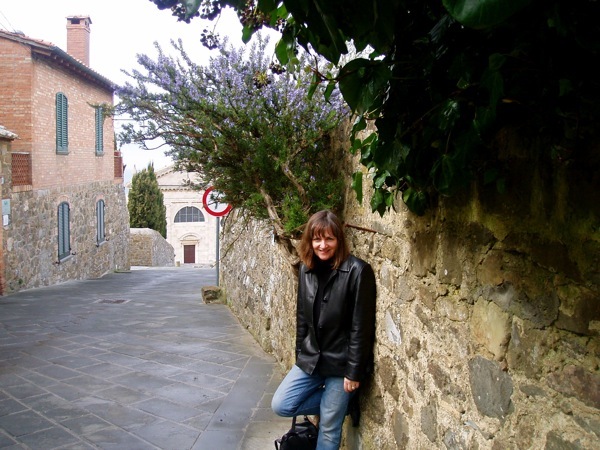 I really enjoy reading your blog – Italy & food…two of my favorite things!!! And what a great combination! I’ve noticed that some of the blogs I’m following take part in “Gratitude Fridays”. Is this a special club? I would like to take part but not sure if I am eligible to join…is it open to anyone? Thanks for your help. And I’m grateful for your blog!!! It’s always very enjoyable! Barbara-you absolutely could join. Go to Diana’s blog at Creative Structures and leave her a comment and she will add you to the list. It’s a nice way to finish up the week. Wish you were here to cook for us. Went out for birthday dinner with your mom and I had a lousy meal but the cheesecake was good. Can you guess where we were?Made brownie pudding from B to B Ina’s cookbook today and your mom did most of it. Can’t wait to try it tomorrow nite. Smells yummy. This is fast becoming my favourite food blog! Thanks and keep up the good work. Phil-thanks so much! I’m off to the kitchen right now to get a head start on dinners for this week! Anyway, before i get carried away, i love your blog! Your pictures are beautiful! Rosemary-so nice to meet another Italy fan. We would love to live there for a year at some point. Thanks for your compliments on the blog! I wish I could drop everything and visit tomorrow! Jennifer-thanks for the compliments-I started this blog a few years ago because I needed an outlet for my Italy and cooking obsession! i have been enjoying your site and your picture at the top for a while now. I went to Italy last year and can’t get it out of my soul either. I just love checking your site and seeing that picture. You mentioned thinking about baking through a book with a friend of yours. I really do like the Baker’s Dozen book a lot–you should look through it as a possibility–unless you have something different in mind. Wanda-I don’t have a book in mind-I’ll check out the one you’re using! Thanks. I like your blog, drop by to visit mine if you have time…. I’m a young Italian woman in Canada, I’m sure you can find posts you can enjoy! Elena-how did you end up going from Sardinia to Canada? I would love to visit Sardinia. Thanks for letting me know about your blog! Lovely blog. Good writing, great photos, interesting subjects. What’ s not to like about Italy and food? I could have sworn that you posted a recipe for Brutte e Buone, but I cannot seem to find it. I wonder if I am thinking of another website. Gosh I love those things. Pat-thank you for your compliment. I thought I had made them too, but I guess not! I happen to run across your blog while doing research on Calitri, Italy. My great grandparents were both from Calitri – Maffucci and Borea. I own a small winery in Napa called Due Vigne, featuring Dolcetto, Nebbiolo and Cabernet. Maybe we could feature some of your fabulous recipes paired with our wines on our website? It’s Erin from the Olive Notes! I had a quick question for you…do you have any lodging recommendations in Arezzo in the center? Wow-we have the same obsessions! I need an outlet so my friends will not have to listen to my constant ramblings about Italy and cooking all time. I have a website formulated in my mind and a list of 30+ blog titles. Someday it will be up and running! You have inspired me to keep going! I am lurking in your shadows, gleaning from the glimpses and enthralled by your convictions of living your life to the fullest! Bella…you are! Eliza-thank you for stopping by. I have lots of dreams and am trying to make them come true. Hi. I have just found your blog. Well done for four years of blogging. The food and recipes look great and I like the tips about shops to visit. Hello, I’ve nominated you for a Liebster blog award because I think your work is great..! I fell in love with Italy years ago and almost moved there! Also a huge fan of fresh, homemade cooking, I think what you are doing is so awesome! Love Cat Way- I dream of spending a year here at some point.But for now, I’ll take whatever I can get. Just discovered your blog, it looks so lovely. I will be reading over all your archive! Wai-Yuk-thank you for stopping by my blog-I hope you enjoy some of the older posts too. I have just discovered your blog, as I was looking for information on Lucca. I am going to read as much as possible of your previous entries, it looks so interesting ! Celine-so happy to hear from you! Are you planning a trip to Lucca? I will be going there in a few weeks so please check back for my posts. Thank you for your message. I am planning a trip in Lucca next May. I read your page about a perfect day in Lucca and I took note of the cafe and pasticceria that you mentioned. I am also hoping to visit the Palazzo Pfanner. I am looking for to find more info about Lucca in a few weeks ! Dear Paninigirl, just found your blog. My grandparents are from Calitri also. A family member will be over there May 2014. For a first time visit what would you recommend? I don’t think we have any family left there now. Carol-I’ve only been to Calitri once for an overnight so I don’t have any recommendations. I hope to be there this fall and would love to hear what you did during your stay, so let me know. Hi Paninigirl! Finding your blog is like stumbling upon gold! As someone who has lived briefly in Roma …i have never managed to shake Italy from my system…and after reading your beautiful descriptions, i am missing it all the more!! I’m an American, single mother, hoping to base in Lucca with my little boy next year. You referenced an amazing realtor in one of your posts and i would be indebted if you could pass along the name of this person or their company! I am trying to come out for a few weeks this August to explore my options! Also, if you have any upcoming food-focus groups, I’d love to hear about these as well. Thanks so much for the extra sugar you’ve added to my cappuccino this morning! I came across this blog and was curious of who this may be since my last name is Capossela and my family is from Calitri too. My great grandparents were from Calitri. My husband and I just bought a house in the Borgo (ancient part of) Calitri. In fact, Paolo and Maria Elena are our next door neighbors. The house is being worked on now and we hope to move there before the end of this year (2015). I have many photos of the area. We are so excited and can not wait to move. If I ever get the time, I am going to write about the hurdles of moving overseas. It is all worth it. The lifestyle and mostly the people! When someone asks where Calitri is, I just reply, “it is right next to heaven”. Barbara-how exciting and I am envious! I hope to get to spend a month there at some point. I would love to hear about your experience with your new home so keep in touch. I`m so glad I found this blog. You do some great work on it!